Sonic is one of my favorites. Their food is okay but their drinks and treats are bomb. Nothing like an ice cold, happy hour, half priced Sonic beverage. This is kind of ridiculous how seriously bad I miss Sonic drinks (especially in the summer! ), but it’s true. What’s a girl to do? Well, I’m a DIY girl and I decided to take matters into my own hands. Instead of driving 2-3 hours to the nearest Sonic, I scoured the internet for a copycat and tweaked it until it was perfect. In my most humble opinion, I nailed it. 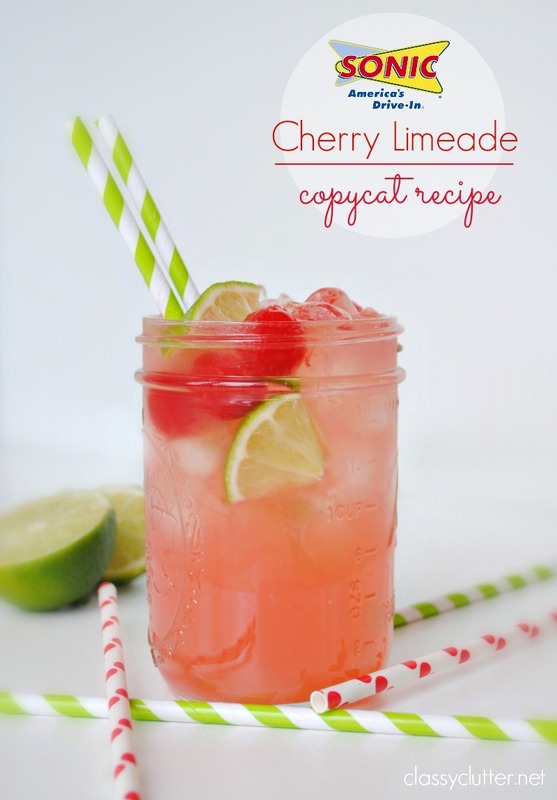 The Sonic Cherry Limeade copycat recipe is born. Oh, it’s the easiest thing ever. You’re welcome. 1 12 oz frozen limeade from concentrate – I used Minute Maid. Not sure if the brand choice would change the taste but Minute Maid was perfect. 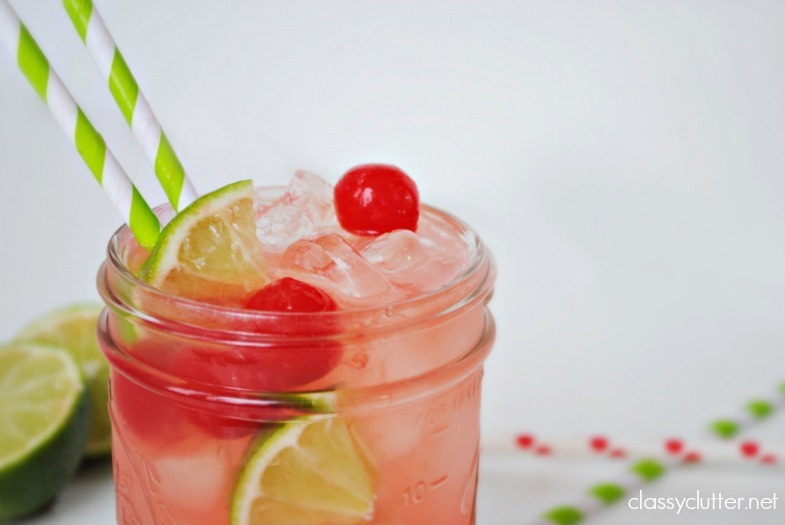 In a large pitcher, combine Sprite, frozen limeade and the entire jar of maraschino cherries (including the syrup). Mix slowly so your Sprite doesn’t go flat. This drink is perfection. You will love it. Looking for more Sonic Copycat Recipes? 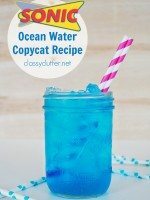 Try this amazing Sonic Ocean Water Copycat Recipe! This made my day! I LOVE Sonic Cherry Limeades, but have not had one since I lived in TX. Been in NY for 3 years now and I CRAVE these so often! Going to get supplies today. 🙂 Cheers! Grenadine works well too. 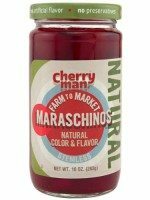 In fact it is basically the same thing as Cherry syrup. Used to make a Shirley Temple and other various drinks. 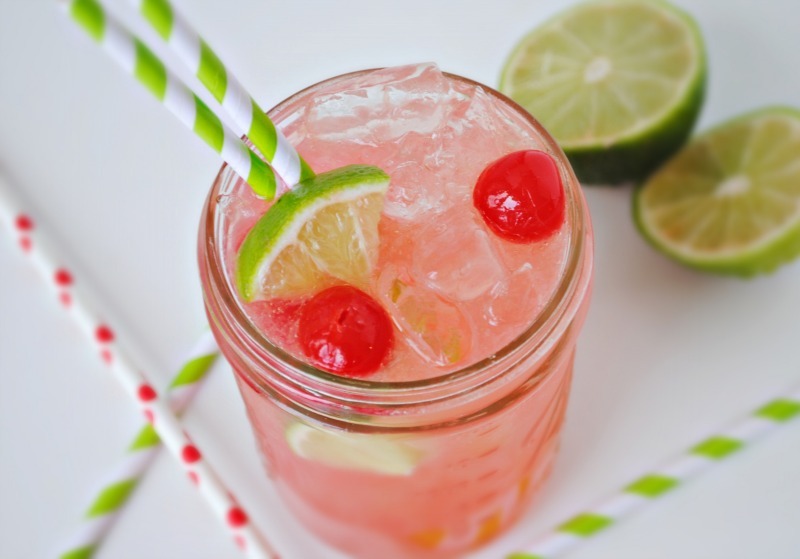 I often make cherry lemonade or cherry limeade ( adding in Lime Coridal which is amazing). Never have I mixed with Sprite, I will definitely try this as I love Sonic too! But I’m in Canada and sadly there is no Sonic here, or in any neighbouring states. 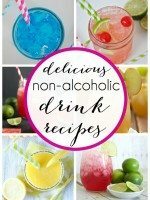 Thanks for sharing an alternative recipe! I am so excited I found this recipe. This is my moms all time favorite drink. She is visiting next month and I am going to make it for her. She will be quite excited. I know what you mean about missing fast food restaurants. I still dream about chic-fil-a milkshakes 😉 happy new year! This will make my husband and children very happy! Thanks for sharing. I am addicted to Sonic Limeades! Thanks for the recipe. Would love to have you link up at Link’n Blogs with this post, too! I have good memories of Sonic too! You have made me feel nostalgic! 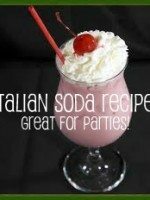 I love pink drinks, they just make me feel like it is a party. This will be great for kiddos and adults for the Super Bowl! Our readers will love this idea. Love this!! I miss AZ food too! Mallorie, this looks so tasty. Lovin’ your blog, especially that fun-loving profile pic. Found your site from Super Saturday and so excited to take a look around. Pinning this recipe. Yum, Mallory! I love a good Sonic hack, that way I can stay home and enjoy my drink without having to brave the AZ heat, ha ha ha! 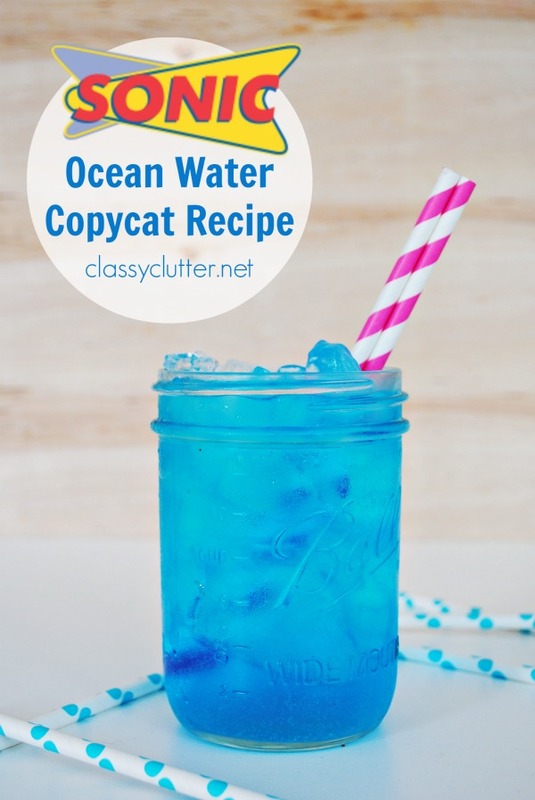 I’d love to have you link this up with me for the Create & Share DIY and Recipe Party, this would make an awesome addition! I’m having a cook-out this weekend and wanted a fun drink so I decided to give this a test run today… YUM! I’m glad I have a pitcher to myself that I don’t need to share 😛 Thank you for sharing this! Hi I am a big fan of the cranberry Limeaide does anyone have that recipe? Would be so happy to receive that recipe.. For 4 years when coming home from Boston after a day of chemo and radiation for my son we would stop into sonic and get route 44’s. Sam died August 2,2014. So needless to say I have not had one since then and I am craving that beverage. Really hope someone out there has the recipe. Thanks for helping!!!!!! Back in high school (in the 80s), before Sonic “trademarked” the Cherry Limeade, we would order a Cherry, Vanilla, Lime Sprite. The Cherry Limeade they serve now didn’t taste the same until I asked them to add a shot of Vanilla to it. Now they taste the same as the ones we used to order back in “The Day”!! Thanks for the recipe. I was just wondering how you might cut this down to single servings? 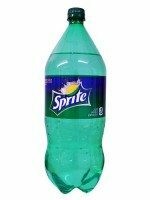 Like possibly using a can of sprite instead of a 2 liter, but then how much of the lime aid concentrate and how much cherry syrup?